Exploring the entirety of space is impossible in the real world, but it’s now been done in EVE Online. A player by the in-game name Katia Sae is the first player to have officially visited every one of the game’s 7,805 star systems. Even more impressive, they did it without losing a single ship to EVE’s notorious pirates. Katia’s journey began in December of 2009, in the wake of the launch of EVE Online’s “Dominion” expansion. “CCP was starting the rebeautifying effort of New Eden. They were updating the planetary graphics and background nebula, and I decided I wanted to see that,” the player behind Katia explained to Kotaku via Discord. They had no idea that this journey of simple curiosity would end up taking the next ten years of their life to complete. Ten years seems like an incredible amount of time to explore the world of a video game, but EVE has a scale unlike other games. Katia’s journey was not as simple as visiting every system and immediately moving onto the next. The goal was to visit each system and actually explore it, visiting and documenting each area’s planets, monuments, and quirks. On Katia’s blog the journey is captured in a combination of in and out of character posts, covering the ten years of exploration. In addition to the enormous amount of time the project required, Katia Sae was an alt, or alternate character, and not the only pilot the player behind her focused on. Graphic: A graph from Katia’s blog tracking her journey. Over the duration of her travels Katia accrued over 50,000 screenshots of the game’s updated graphics, hosted on a blog. Amongst her favorite shots is the wreck of the first of EVE’s enormous Titan-class ships, Steve. The ship was destroyed in a battle between warring players in 2006, and a permanent monument was erected in space to commemorate the first Titan to ever be created and destroyed. “The wreck of Steve was something to see, the first titan kill in game. It’s really something to know that players were being recognized, and able to leave a permanent mark on the game,” Katia said. Image: The wreck of Steve the titan. First to be built, and first to die. The wreck of Steve highlights a style of gameplay in EVE that is foreign to the character of Katia Sae, who was from the first day of her creation a pacifist. Through the journey around EVE’s star systems, Katia never fired a single shot at a fellow player. Taking the path of the peaceful explorer is not an easy choice in EVE; there are a lot of players who prey on peaceful people, seeing them as easy kills and a quick way to get some loot. Nevertheless, it’s a credo that Katia lives by. About halfway through her journey, she found others who feel the same. Katia’s journey started before the inception of Signal Cartel, a group based on peaceful exploration of EVE. “Signal Cartel wasn’t around until about half way through my journey, but I have the honor of being the member with the longest tenure in the corporation, besides leadership,” Katia told Kotaku. The group is dedicated to being peaceful, friendly, and helpful explorers, in contrast to the many pirates and thieves that often come out of EVE. Joining Signal Cartel helped Katia stay focused on her pacifist mission during her journey, by introducing her to a steadily expanding group of like-minded individuals. Katia also encountered danger from EVE’s world itself, especially during the endless hours she spent searching for connections to EVE’s hidden-away “wormhole” systems. The wormholes aren’t connected to the game’s stargate network; to enter them, a player must find one of the roaming wormholes using specialized scanning gear. After a wormhole is found, you can navigate your ship through it into a hidden pocket of space, often considered one of the most dangerous types of space in EVE Online, in part because the wormholes decay over time and then randomly spawn a connection to different systems. There are 2604 wormhole systems in EVE Online, and there is no guaranteed path to any of them. Players can spend hours, or even days looking for a wormhole to a particular system. Eventually, Katia’s journey came to a close, after countless near misses with danger and thousands of images documenting the beauty of EVE Online’s environment. Once her own personal records showed that she had indeed visited every star system there was, she approached the game’s creators, CCP, to see if they would verify it for her. Paul Elsy, aka CCP Falcon, a Community Developer for EVE Online, confirmed to Katia via Twitter that she had indeed completed her journey, but there seemed to be one more system she could travel to: Polaris, the in-game home of CCP Games, where EVE’s game masters, who deal with in-game player support, and other CCP employees congregate to test things in the live server. A few days later, Katia was pulled through a mysterious wormhole and appeared in Polaris, becoming the first player character to ever see the system and further securing her place in EVE’s history. 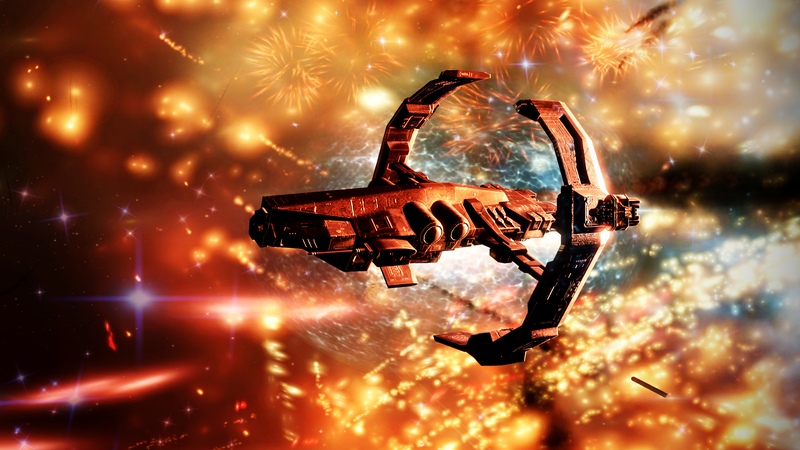 This once in a lifetime trip to Polaris is not the only gift that CCP has in mind for Katia. Last weekend, CCP announced that Katia Sae will receive her own in-game monument. The monument will be based on a 3D rendering of her character model and will be anchored in space in the Saisio system. Saisio is Katia’s “home” system, where she first spawned into the game after character creation. The monument to Katia’s achievement, once launched, will remain in place for as long as the game servers run, commemorating one of EVE’s foremost explorers.